World aniline consumption is driven by consumption for MDI production, which is consumed in polyurethane foam. Most rigid foam is used in construction and appliances, while flexible foam is used primarily in furniture and transportation. As a result, aniline consumption closely follows the construction, automotive production, and original equipment manufacturing sectors. 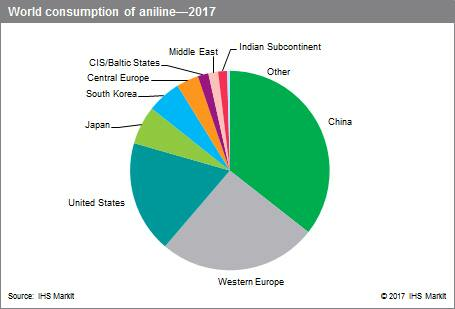 World consumption of aniline is forecast to grow at an average annual rate of about 4.9% during 2017–22. MDI production accounted for over 95% of world aniline consumption in 2017; other applications include use as a chemical intermediate for rubber-processing chemicals, dyes, and pigments. Since most MDI producers are captive in aniline and its precursor nitrobenzene, typically in integrated units, nearly all MDI expansions result in increased production and consumption of nitrobenzene/aniline. MDI has been the driving force behind world growth in aniline demand since 1982. Future demand for aniline will continue to depend largely on MDI requirements. MDI is consumed in polyurethane (PU) foam, both rigid and flexible. Most rigid PU foam is used in construction and appliances, while flexible PU foam is used primarily in furniture and transportation. As a result, consumption of nitrobenzene/aniline/MDI largely follows the patterns of the leading world economies and depends heavily on construction/remodeling activity (residential and nonresidential), automotive production, and original equipment manufacturing. MDI growth has been driven by “green” initiatives, sustainability, and the effort to lower emissions of CO2. The Middle East is forecast to experience the largest increase for aniline demand during 2017–22, followed by the United States and the Indian Subcontinent. Central Europe, Japan, and Other Asia are expected to have small declines in aniline demand from 2017 to 2022. Additional MDI capacity/production is the predominant factor for increased production and consumption of aniline.